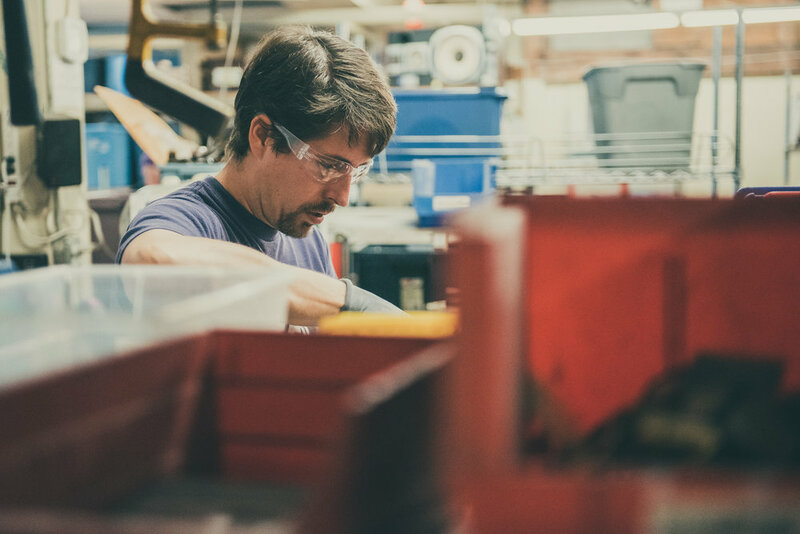 Free Geek is an electronics refurbishing and recycling nonprofit based in Portland, Oregon. Donated electronics and computers are ethically recycled or are repaired and sold in the thrift store or donated to other nonprofit organizations. Volunteers help at all stages of the process, and after 24 hours are able to "adopt" a refurbished computer for free. Five hundred and seventy-six computers were permanently "adopted" by volunteers in the past year, and 1,290 were granted to organizations. Since its founding in 2000, Free Geek has ensured that thousands upon thousands of electronics have been reused or ethically recycled. Each week 6,000 pounds of disassembled computer bodies are sent to recycling. That's an enormous effort with a big payoff--both in terms of reduced waste and in connecting community members with skills and hardware to access technology for their work and home use. Another Look was referred to Free Geek by a client we interviewed at the Mercy Corps Northwest Reentry Transition Center. Free Geek will soon use our photos on their website, as well as using our writing and photos in their email newsletter, in Give Guide flyers, and as part of their ongoing outreach efforts. Free Geek has mastered the art of the clear, tangible, and achievable goal. 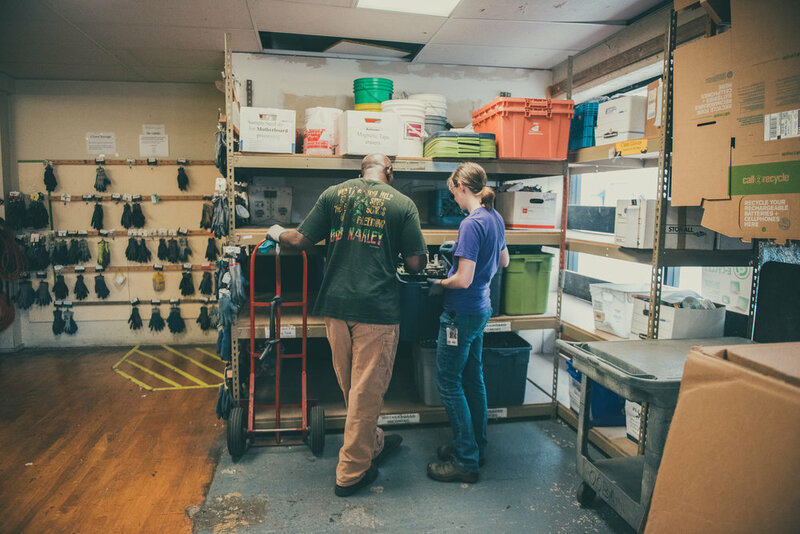 Walking through their warehouse means witnessing confident, motivated staff and volunteers, many of whom have no prior experience with electronics aside from their use around the house. But at Free Geek, these volunteers wield screwdrivers and sort parts with the confidence born of knowing an exact end goal and purpose. Rows and rows of computers await final testing and are then sorted into their donation destinations: many are bound for local organizations in need of a free computer—over 1200 computers per year will be granted in this way. Other repaired electronics will stock the shelves of the Free Geek thrift store, which provides 70% of the organization’s budget. The rest will be “adopted” by Free Geek volunteers, who are eligible for a free computer after donating 24 hours of their time. 6,000 pounds of steel in the form of disassembled computer bodies are recycled each week. Not all of the 11,000 electronic items donated each month can be repaired. 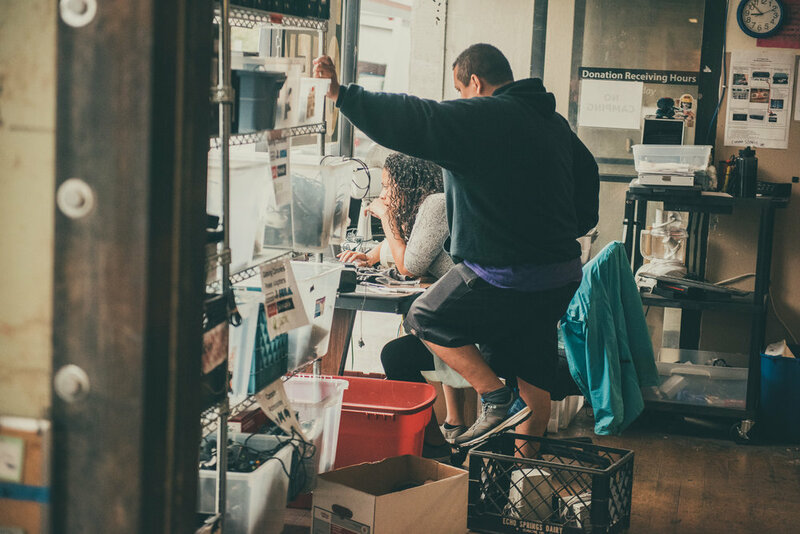 Volunteers and staff sort items, and a key mission for Free Geek is to ensure that the electronics parts are safely and ethically recycled, rather than ending up in landfills. Each week, the organization fills an enormous recycling dumpster, and sends 6,000 pounds of disassembled computer bodies to the steel recycling plant. One of the truly remarkable organizational commitments Free Geek has made is to follow the path of recycling to be sure that every step of the process follows best environmental practices and uses fair and safe labor standards. Too often, e-waste recycling is undertaken in unethical ways. Free Geek ensures that every phase of their chain of recycling organizations is ethical: no prison labor, no health and safety shortcuts, and no damage to delicate environmental areas. Over 300 volunteers work at Free Geek each month, with over 20,000 total volunteers in Free Geek's 15 years. Volunteers can "adopt" a computer after 24 hours. 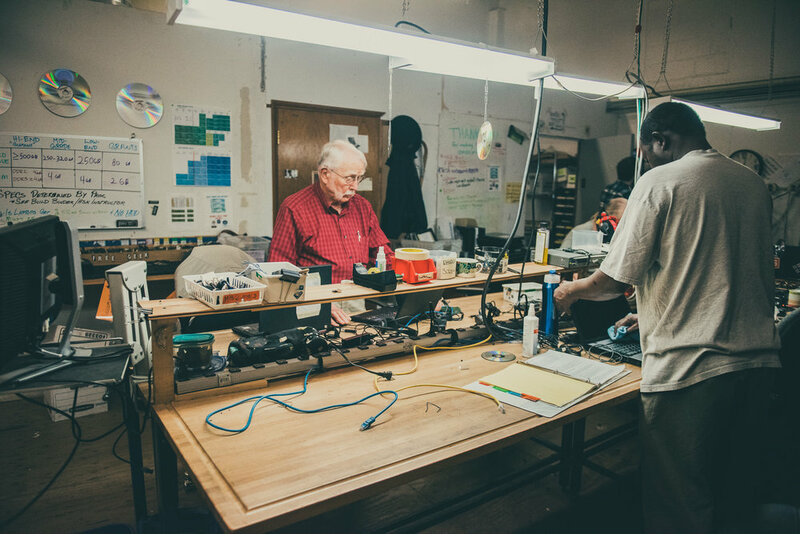 Some volunteers are short-term, motivated by the goal of a free computer and the satisfaction of working with an organization where you can witness the balance of success in tonnage and repaired machines. Others have donated hundreds of hours, including their top volunteer who has committed a staggering 3,300 hours (and counting) and is honored with a spot on a break room bulletin board alongside other volunteer milestones. The volunteers’ ages range from middle school to retirees, and include immigrants, people with disabilities, people completing court-mandated community service hours, and individuals seeking careers in the hardware side of the tech industry. Many staff began their work with Free Geek as volunteers, some committing years of free labor before a confluence of opportunity and life events led them to work in the warehouse: in the IT support center, securely wiping hard drives, running the sorting center, supervising volunteers, training new repair volunteers, and more. The Free Geek warehouse bustles with activity. Computers are being torn apart while others are reassembled. Electronics are sorted and stripped, or sent to the thrift store shelves. Everywhere, people are busy. Staff and volunteers, all ages and races, and all levels of confidence with technology… they’re working away at Free Geek.